MONTREAL, QC — August 1, 2017 — Performance advertising technology company SourceKnowledge today announced the opening of new offices in Los Angeles and Toronto, expanding its presence in the U.S. and Canada. Headquartered in Montreal, the company has hired four employees to staff these new locations. Account executives Ryan Martinson and Mike DeMare will spearhead the Los Angeles office, which is surrounded by a number of other tech companies at the WeWork Playa Vista. The Toronto location, located between the city’s renowned financial district and entertainment district, will be supported by account executives Justin Brunette and Kevin Au. Martinson and DeMare will report to Jason Larocque, Managing Director, West Coast, while Brunette and Au will report to Shane Black, Managing Director, East Coast. SourceKnowledge is a leading performance advertising technology company built for data driven marketers. Our full-stack marketing platform, Engage®, gives marketers the tools they need to identify, recapture, convert, and measure high value audiences across any device. We help brands, agencies, app publishers, ecommerce, and SaaS companies to acquire better customers. Deloitte ranked SourceKnowledge as one of the fastest growing companies in the North America Technology Fast 500 in 2014 and 2015. 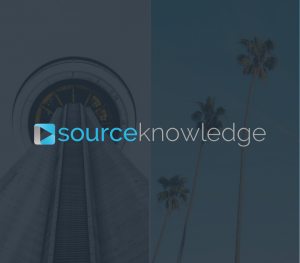 Founded in 2009, SourceKnowledge is headquartered in Montreal with offices in Vancouver, Toronto and Los Angeles, and clients around the world.